We first took the “bing it on” challenge together and I continually got Bing as my result. I slowly began to switch over to Bing when I thought about it, but didn’t change my default search engine in my browser settings until I discovered Bing Rewards . Yes, rewards. As in, getting credits for something I do every day anyway and being able to use those credits for things I want. I just signed up about a month ago, and by last week, I had already reached Gold Level. It doesn’t take a lot of work. Sign up for your account, I just signed in with Facebook. Easy peasy. Then, you start to earn credits just by searching. You can get 15 per day on your computer and 10 per day by searching from your mobile device. Two searches = one credit. So simple. I pretty much hit my 15 credits a day every day on my computer without even thinking about it now that I have Bing set as my default search engine and just keep my account signed in. One of my favorite things about Bing Rewards is the handy little Bing bar at the top of my search page that tells me how many credits I have and updates me when there are extra little fun credits available to earn. A few of these seem to pop up everyday and will just have a little tidbit of info and when you click it, it pulls up search results to learn more. And you get a credit. And sometimes you learn something new. There are also other fun specials like, double credits on Tuesdays in May and getting bonus credits when you hit Silver Level or invite a friend and they do some searching. So, what can you do with all of these credits? Well, there are a few of options… you can enter contests, “buy” gift cards, or donate your credits to schools or organizations. So far I’ve entered a few contests for 40 credits, and thought about getting myself some Starbucks giftcards as treats, but since I’m doing my best to stop drinking caffeine, I’m opting for Amazon gift cards. For a $5 gift card, you spend 525 credits, or, with your gold level discount, 475 credits. How that breaks down: Sign up for your account, set your default search engine to Bing, keep your account signed in, search, get free stuff. How it’s working for me so far, I earn roughly 25 credits a day, 6 days a week (because I try to keep my Sundays tech free-ish), invited a few friends to sign up, and within my first 3 weeks, I’d entered a few contests with my points and have now just redeemed my first $5 Amazon gift card. I’ve got a pretty long Amazon wishlist of things I likely won’t buy for myself, but with these gift cards, I feel like I can treat myself a little bit. I got my first gift card today and ordered Grow Your Handmade Business: How to Envision, Develop, and Sustain a Successful Creative Business by Kari Chapin , because I happen to be taking her 3 day course on Creative Live this week and am feeling super inspired (and because I loved her first book). Getting $5 bucks off because I’ve been searching away this month is pretty awesome. I love knowing that Bing is a company that’s engaged, supports events and organizations that I like (like Alt Summit) and they reward me for searching. I’m required to disclose a sponsored partnership between our site and Bing. I have been compensated in exchange for this post in the form of payment, product or experiences. 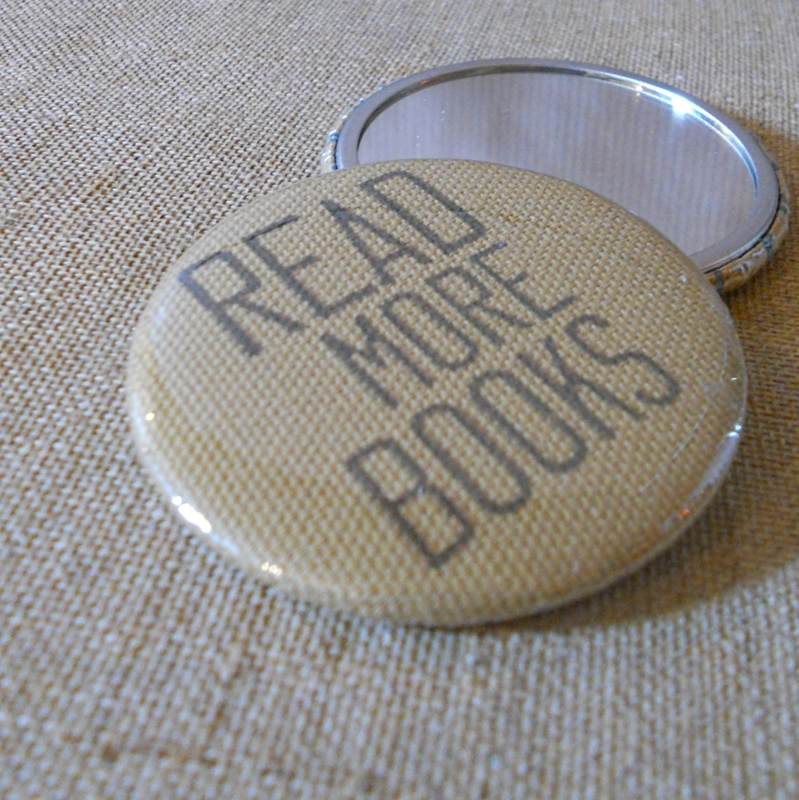 At the end of last year, I made a print that says “Read More Books”. I mostly made it because I had planned on that being my 2011 goal, but I thought perhaps some other people would like it too. I only printed a few of the prints at first and sold out at my first fall show last year. I decided to print 100 more of the book prints before the Girlie Show and Jingle Bash and by the time I got home from Fort Worth, I only had a couple left. Ooh, and if you watch this video from the Girlie Show, aside from seeing what a fun show it is, you’ll see my print at about 1:49 and a few little clips of my booth elsewhere. Since the print was so popular, I printed it on tea towels, pillow covers, bookmarks, and pocket mirrors.. goodness, just about everything! Anyway, I’ve been living up to reading more books. I’m spending this lovely winter afternoon reading a few that I got for Christmas. First up is Crafting A Meaningful Home by Meg Mateo Ilasco. I’ve loved her other books and so far this one is no exception. I think I’m going to make some of the button garland asap. The book is colorful and lovely and I love the book trailer for it too. Of course I’ve been enjoying The Black Apple’s Paper Doll Primer. I started drawing out ideas for some of my own paper dolls last year, so of course I was really excited when I heard about this book. I kept bugging the husband before Christmas making sure that someone was getting it for me. Paper dolls have always been dear to me.. I remember many afternoon of playing with them with my grandma and one time while she was busy, my grandfather tried to help me with cutting some out. He ended up cutting off all of those little darling white tabs on the clothing and it really broke my 8 year old heart. To cheer me up, my grandma helped me make some new clothes for them with plain white paper and we cut out real fabric to attach.. such a sweet memory that I’m so happy to have. 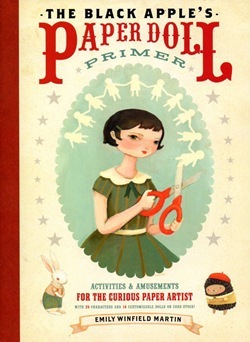 In the Paper Doll Primer, I think my favorite is Sylvie. I didn’t end up finishing the paper dolls that I was making last year, but I have drawn out plans for a paper doll themed tea towel and pillow cover, so be looking out for that this Spring. And maybe I’ll eventually finish the others that I was making.. I was trying to theme them after some of the lovely ladies I know. I’ve been saving the book I’m most excited about reading until I finish the others. Do other people do that? 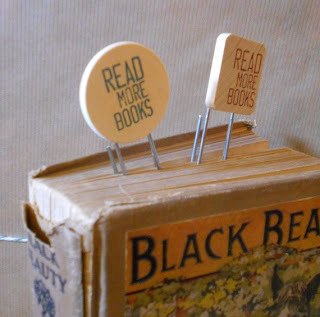 It’s like the dessert of my current reading list. 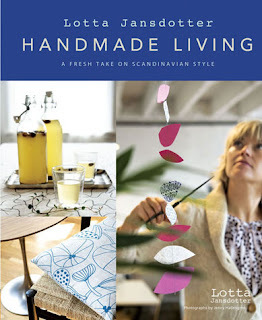 I am so inspired by Lotta Jansdotter and have adored her other books, so I’m sure that Handmade Living will be no exception. It’s no secret that I’m a bit obsessed with Scandinavian design.. and handmade things, so I think this book will be just lovely. I’ve flipped through the pages and can hardly wait to sit down and savor each page.